Road test: 1984 Mercedes-Benz 300D. After spending seven months driving a whole array of French cars and a Fiat throughout France, Italy and Spain, I’ve returned to the land of funeral potatoes, multicolored Jell-O and missionary farewells: Salt Lake City, Utah. The first order of business was to buy a car. I looked at a couple but finally settled on one: a 1984 300D, this time with a turbo charger. Let’s see how it compares to the 1979. In all fairness, I should mention that despite being older, the 1979 was in better shape. The 1979 had just barely crossed 195,000 miles when I sold it and this one is sitting at 194,855. Problem is, the odometer rarely works, so it has a bit more than that. It has the same gas gauge issue as the 1979. Every now and then it’ll display the correct amount but it usually just bounces around, sometimes in tune with the music. Coming from an n/a car, you really feel the extra power the turbo delivers when you’re driving on flat ground around town, avoiding traffic cones left and right because UDOT can’t be bothered to finish a construction project. From a dead stop at a traffic light (and you have a lot to choose from in Salt Lake City), it’s a bit slow until you get to 15mph, then it picks up and it’s alright. 40-45mph is optimal cruising speed for this car. Going on the freeway is a bit of a chore, getting to 65mph is interesting if the on ramp is uphill. I’ve gotten it up to 70-75mph but it’s much more comfortable at 60mph. One has to keep in mind that it’s 24 years old. Another point of concern it shares with the 1979 is the transmission. 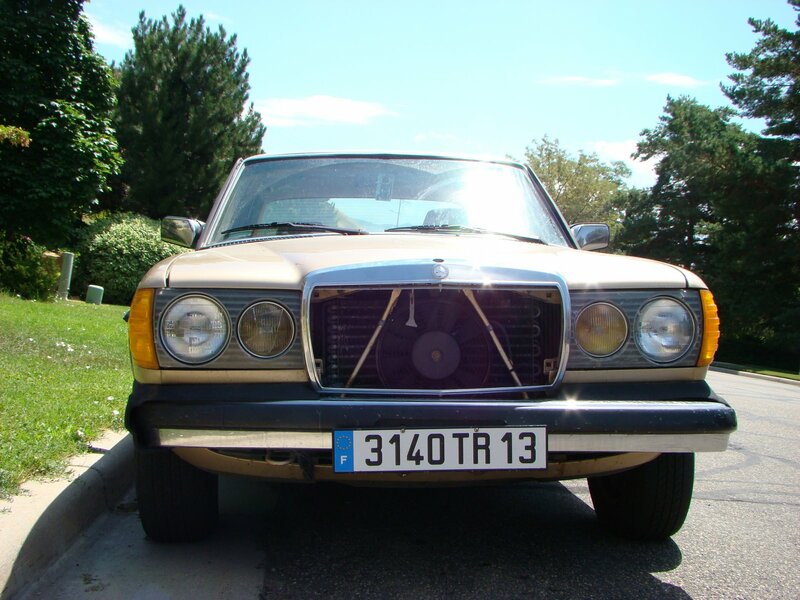 Mercedes did a fantastic job designing the w123 series.. except the automatic transmission. I’ve described above what shifting it manually is like, keeping it in drive is just as bad. If you keep the rpms low it shifts fine but that stops as soon as you get into higher rpms. Much like the old one, it never seems to hold a gear when you want it to but it does a great job at it when you don’t want it to. Not to mention the longevity issues these have, they’re not even close to being on par with the engine. The interior is the same as the 1979, save for the radio. The 1979 used a very vintage looking Becker unit, this has a more “modern” Becker unit that I actually pulled from a 190E, but it’s identical to the stock radio the 300D used. The seats are upholstered in MBTex, which holds up very well to time and wear. The steering wheel measures the same Freightliner-worthy diameter but the design is slightly different. Unfortunately it doesn’t have a knob to adjust the idle. Bottom line? The turbocharger is great, it makes the 300D infinitely more driveable, but the transmission is still a huge problem. I haven’t been able to compare gas mileage between this one and the n/a one but when I do, I’ll report back. Previous post ← What is this? >If you are having shifting problems, you might have vacuum problems. These cars seem to almost run on the vacuum system, not unlike pre-FI Honda Civics. If you want the input of plenty of wonderfully obsessive geeks, head over to mercedesshop.com and ask around in the ShopForum. The turbos should be a little quicker than 75, and should shift smoothly. >I can’t get over how inviting looking the interior is on these cars. >Fantastic. I love these cars and this is exactly how they should be… slightly abused and with lots and lots of miles on them.I want a grey-market 300Dt four-speed. in case anyone needs information on the automatic transmission of this model, let me know. I’ve had about every problem possible.